I had a MAJOR problem when I got into my classroom this summer. You see, my classroom is very small, and with 25 kids, there isn’t a way to have one long line when lining up to go to specials or the end or the day or whenever. You know? So, I always had to have two lines at my door. But, of course, for kinders this is not such an easy thing. They don’t get it. Two lines? How far apart? Where do we put our feet? You get what I’m talking about right? So I always always always had two strips of duct tape on my carpet to show where they should stand. At the end of each year, I just instructed the janitor NOT to take it up and that I would put a new strip right over the top of the old one in the fall and it would look good as new. Well I forgot to get with the janitor this year before I left and this is what I found when I came into my room. They had worked so hard getting the tape up. 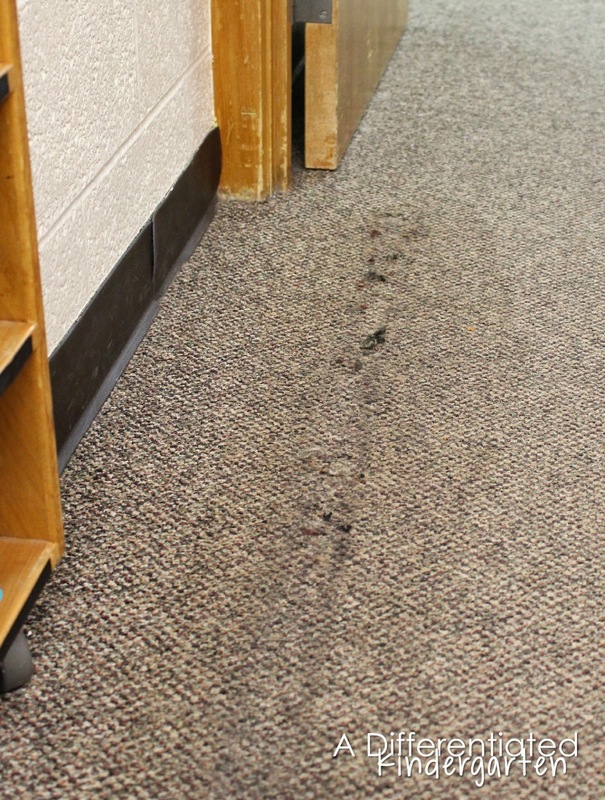 But it left a dark sticky strip on the carpet (and I mean sticky! 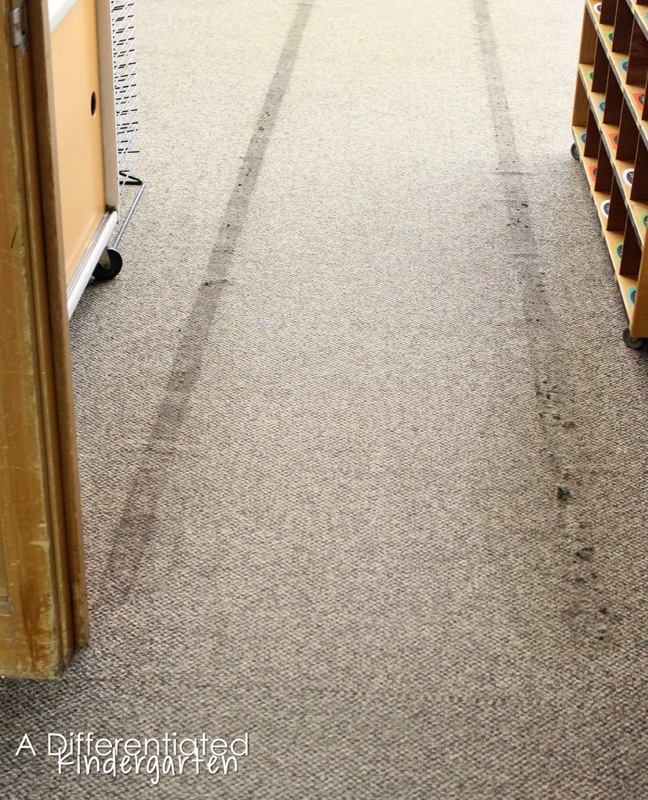 ), and, in places, the threads of the carpet where actually starting to unravel! Ugghhh…. Totally my fault! Yes it’s old carpet, but I really didn’t need to help it along to an early burial with my duct tape fiasco. I really didn’t know what I was going to do, but then I remembered being at I Teach K in Vegas. Our Freebielicious Booth (I loved meeting all you guys there by the way! ) was very near the Sit Spot folks, and I wondered if they might have something to help me out. So I contacted Joyce at Sit Spots, and gave them a small run down of my problem. I knew that Sit Spots had ‘spots’ of course, but I was wondering if they might not also have strips that I could put down in place of my horrible duct tape. Guess what? They do and it worked out perfectly. Now, I like to give my kids lots of choices about how, where and what they read, but let’s face it, kindergarteners don’t always make the best choices. 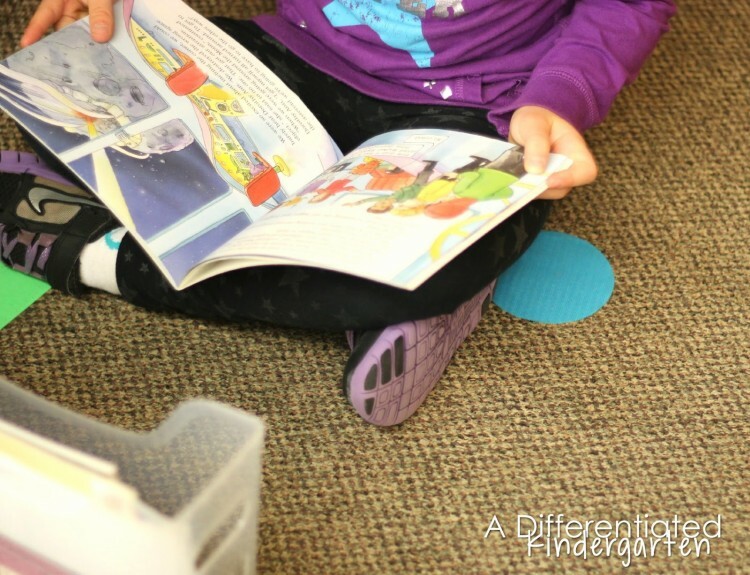 So I placed the spots around my classroom in places that I thought would be good choices, and I gave my kinders many opportunities in those first weeks of practicing ‘read to self’ to try out the different spots. Eventually, they found spots that they liked over others, and they tend to seek out those spots. But the nice thing is, it’s a choice for them but one I’m happy with as well. It’s been a win-win for all of us. These little ‘spots’ and my colorful ‘lines’ have been such a great addition to my room this year. I absolutely love how durable they are, how easily I can move them, and how they can be thrown into the washer for a quick sprucing up. 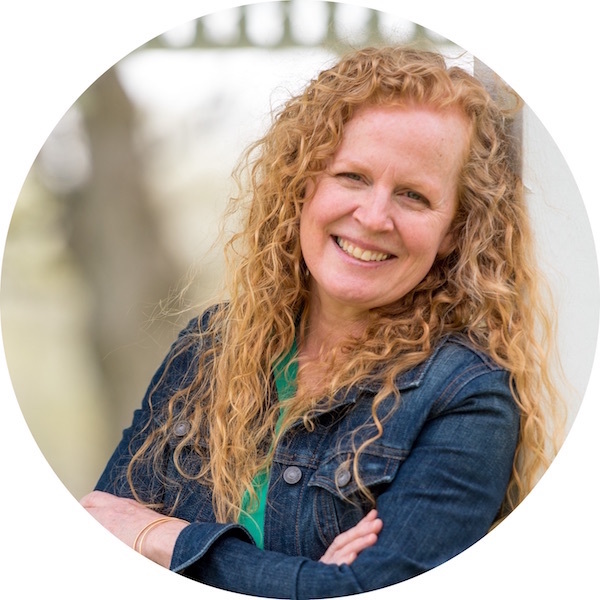 I’m so excited about Sit Spots and how they helped me out with my predicament that I just knew I had to share their awesome products with you. Oh, and heads up . . . Joyce just told me that they also now have ten frame strips for your carpet as well. 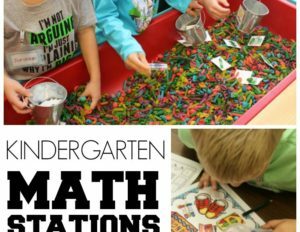 Who doesn’t love kinesthetic math? I do! I know you’re dying to try some of these out for yourself? Well here’s some great news I have for you. Sit Spots is giving away a $50 gift certificate so you can equip your own classroom with their amazing products, too. I can’t wait to hear what you’d do with your Sit Spots! I would love some of the round ones. I think I’d put sight words on them so my kids could hop from spot to spot to practice the words. I have been wanting the Sit Spots for awhile! I have a small room as well with no room for an area rug. 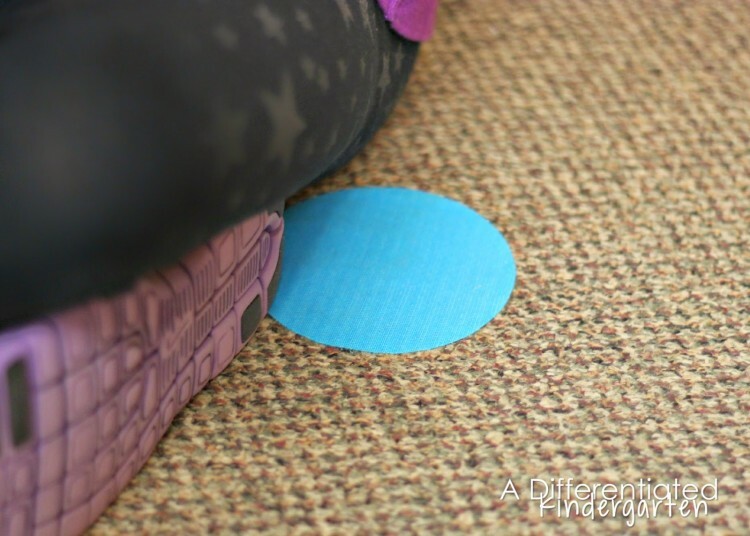 The spots would be wonderful to have to mark each child’s spot to sit on when we are on the carpet. I tried their free sample and they work great on the carpeting in my room. The ten frames sound fabulous, too! I would love to replace the ugly tape on my ugly carpet! I teach grade one and twos and still we have problems finding a spot to sit in. I love all the neat things that SitSpots is coming out with! I love sit spots! I took my big circles and cut smaller shapes with the die cut machine but those keep moving and getting sucked up in the vaccuum.  I wonder if I should’ve used a rolling pin to secure them better or maybe they are just too small. Would love more to try over! I would choose the stars in bright and the ten frame! I would get the shapes and place around the room for reading spots so I wouldn’t have to keep on using duct tape that always gets pulled up. We had to give up our rugs this year so I replaced the rug with sit spots! I got the pockets so they have to sit on their ‘pockets’. I also got an apple to put by the door for the line leader to stand, instead of everyone crowding at the door! I love them and would totally get more for other spots in the room! We are currently using carpet squares to line up but we have to constantly straighten them. I have a lot of students and a small classroom. I would choose the round sit spots for reading in the library. My students sit too close to each other and have a hard time with body space. I would buy the Orange paw prints since we are the Tigers and use them to line up at the door. Love, Love, Love them!!! I have had them for two years and absolutely love them. 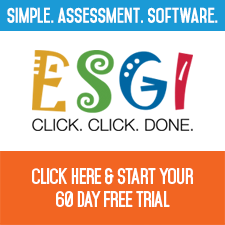 I have talked several teachers into trying them and they too love them. I would try the spots and the tape. 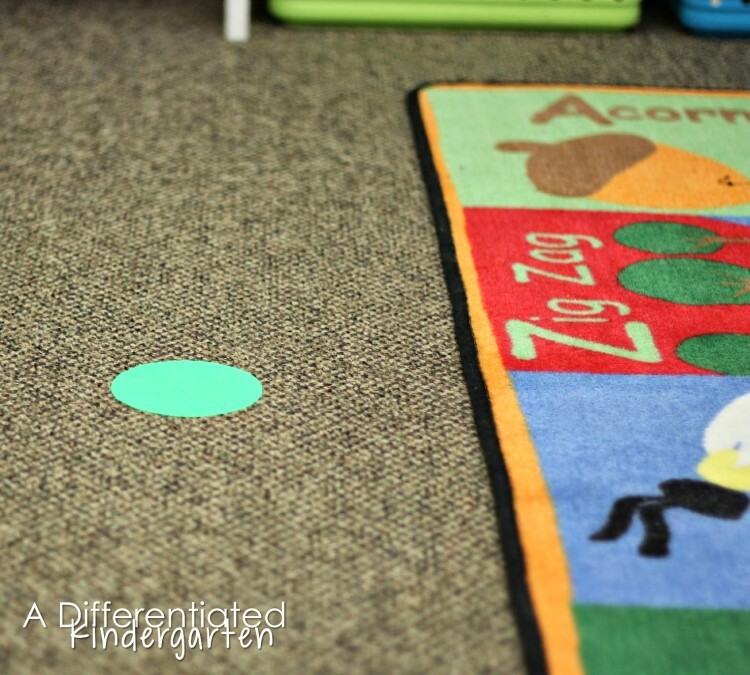 I have a small space as well and certain little folks need their own special spot on the carpet and I love the idea for read to self spots!!!! I would like to try the spots. I think it would be cool to have them and use them for when they get their book boxes out. It’s like you said, they don’t always make good choices! I would use these over by my Promethean board so I would not have to keep telling some of the children to move every day! I would love a set of circles. 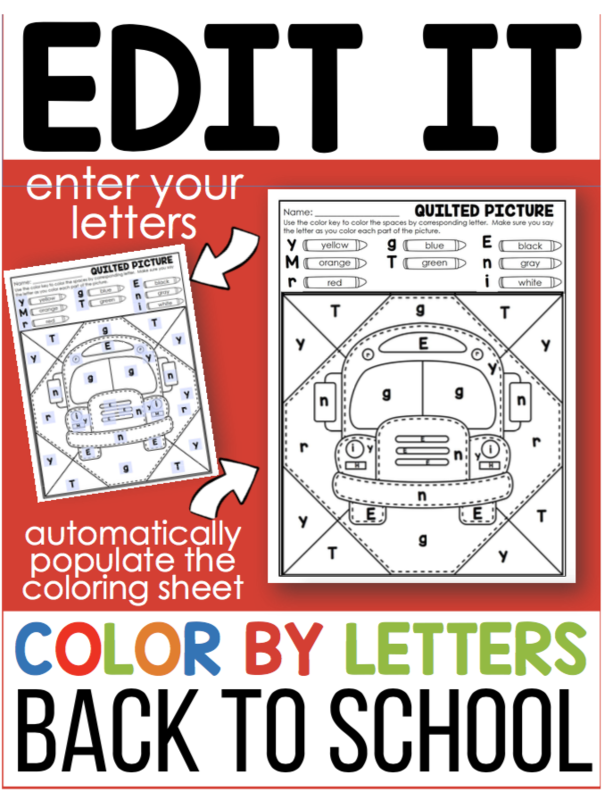 I could see writing words, numbers, or concepts on them fir kids to practice. Thanks for this post, Marsha! 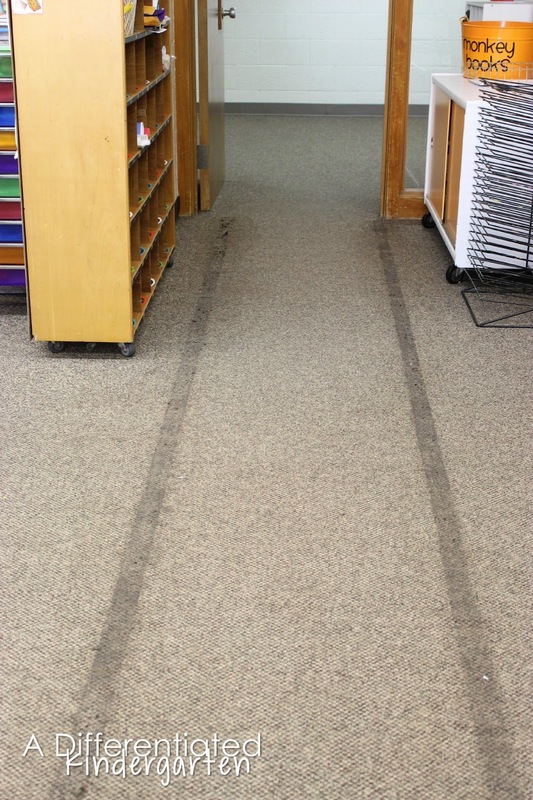 Love the idea of using these during read to self time. I want to try that too! I will order the oh so cute paws. Our school’s mascot is the tiger cub so the paws will work quite nicely! I’d use the bright spots for my carpet by my rocking chair. What great ideas. I’d love the sit spots to mark places the kids can read, as you did. They still get some choice but not in places I don’t want them to go (like under my desk!). Thanks for this opportunity! These are adorable and I like the idea for read to self!!! I love the idea of spot around the room to designate acceptable places for “I Read.” I’m also thinking a spot to designate where to sit on the carpet is easy enough. My students already have assigned seats on the carpet, but it seems like with some students I am always making adjustments. This product seems just too good to be true! I would really like the dots for our carpet area, since I too have a small classroom and can’t fit an actual “carpet” big enough for all of our students! I’d order the circles in bright colors and use them in my Reading room. I love the straight lines and the circle dots. 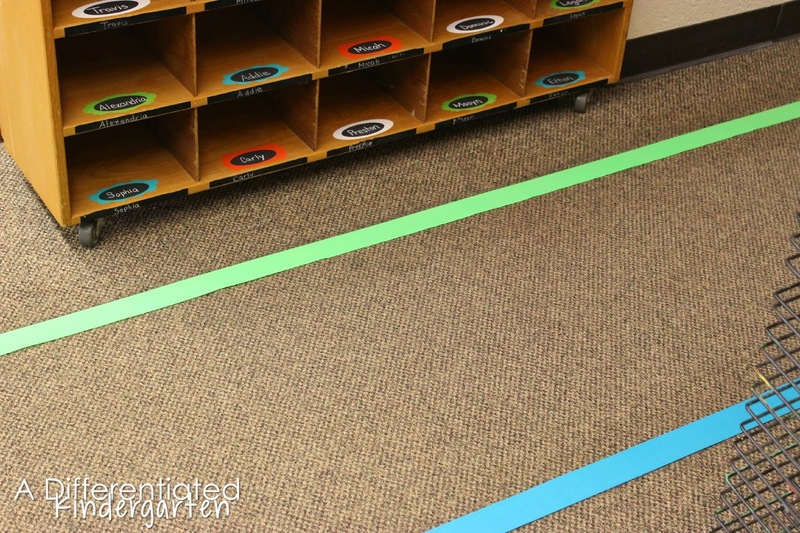 I love the straight lines for where my kiddos need to sit in the front of my room! I would order a variety of shapes in a variety of colors. I would use them as a means to line up but I would also write our high frequency words on them. This way the students would have to tell me their word and the ones that know their HFWs can read them as we walk out of the classroom. I can see this being a good motivator for the students to practice their words. I love the sitspots! Definately would want the ten frame!!! 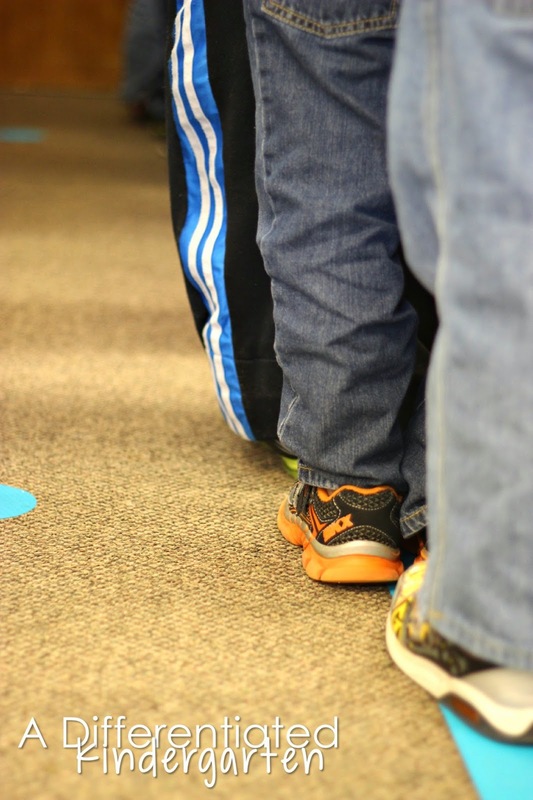 And I like the bright spots…I think they would be great for helping those fidgety little ones maintain personal space. I love Sit Spots and did not know they had lines. I have bought Sit Spots. I would buy some lines with a gift card. I finally just spent my own money and best money spent EVER! Totally solved my carpet issues! Would love to have more for centers, lines, and ten frames! 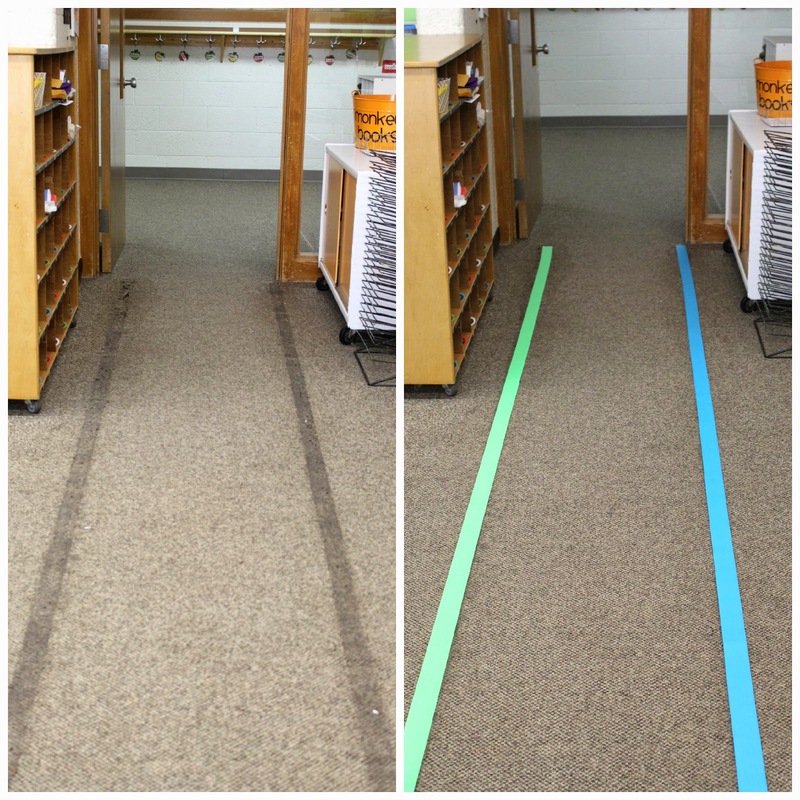 I love the idea of having a ten frame or floor graph that won’t rip when kids crawl on top of it. I love the long lines! I discovered these in Vegas. Great meeting you!!! Gotta have the new Happy Faces  They are sure to be a hit! I would start with lines and ten frames. These are great. I got a sample last year. 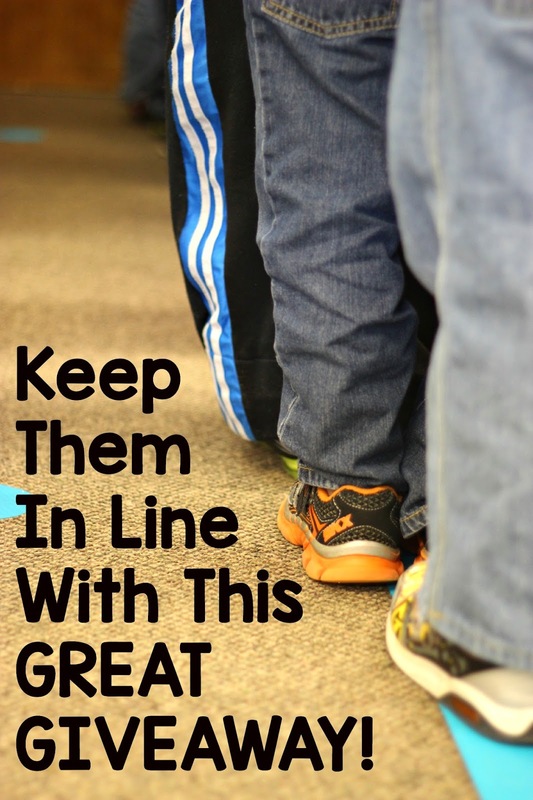 I would love to get the 10 frame and some feet to show students where to line up. I would love some of the round ones for centers! The ten frame also sounds great! I have been wanting these for a long time. I want to ditch the rug and give those growing bodies some room! Sit Spots sound like a great invention! Can’t to try them! I would love some round pink and green ones!!! These look amazing!!! I have fish ones for center spots but would love circle ones for lining up. I love this product! They all look great but would love the round ones in different colors to use for reading spots. Kind of boring but I like the circles! This is a great idea! My kiddos could use some more guidance with choosing spots for read to self/someone! I just love the name, Sit Spots!!! I would love the circles!! I don’t have a carpet so I contact stars to the floor every year!!! Ugh! !